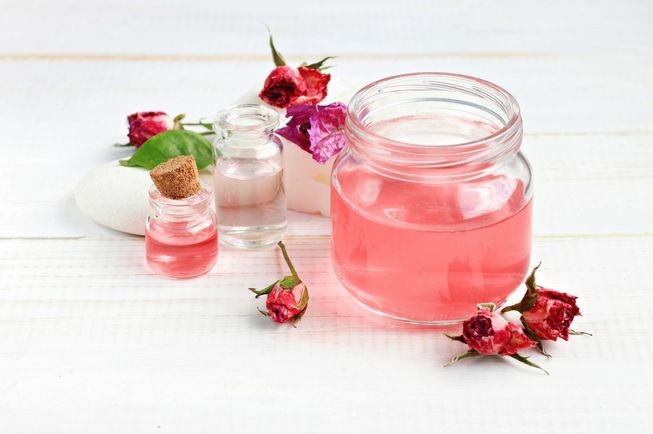 Pecros.com - Rose water is a multifaceted beauty product. Almost everyone loves rose because it’s aromatic scent. This flower also has various benefits if it is processed into rose water. Here are some of the benefits of rose water for our face! The first benefit of rose water is that it can be used as a makeup remover. After using makeup all day, of course the face must be cleaned immediately so the skin can breathe. The purpose of cleaning make up is to avoid accumulating various bacteria and dirt on the face which can cause various facial problems. If you run out of makeup cleaner, rose water can be used as your emergency makeup remover. You just need to mix coconut oil and rose water, then apply on the face using a cotton swab. The second benefit of rose water is to overcome acne. Acne is a facial problem that cannot be underestimated because besides making it uncomfortable, acne can also damage a person's appearance. Rose water has antibacterial properties so it can be used to treat various skin infections caused by bacteria such as zits. You just need to apply rose water on your face. You can mix lemon juice for better result , but keep in mind that lemon juice should not be used if you have a dry skin. The benefits of rose water can help you to brighten your skin, especially the skin around your eyes. For example, when the eyes are swollen or dark because you lack of sleep, try applying cotton that has been given rose water on the area around the eyes. Then, leave the cotton for about five minutes. Other benefit of rose water is it can also help you to get perfect makeup. For example, when your makeup looks dull, try spraying rose water. This method can refresh your face and make it radiant again. Rose water can also be used as a facial toner, especially for those who have acne problems. Rose water is often used for various acne-prone skin products because it can kill bacteria. Not only that, rose water can also be useful to relieve inflamed acne. Launching Bold Sky, rose water that has been processed into essential oils contains antioxidants that can get rid of free radicals on the skin. Interestingly, this product can also prevent clogged pores and cleanse the skin from dirt. As a result, facial skin will look healthier and more radiant.